Wanted: One Smart, Kind, Thoughtful -- And Totally Gorgeous -- Man! Since she was a child, Marlo Mayfield has kept a list of traits her Prince Charming must possess. After a series of bad relationships, Marlo's beginning to lose hope that her ideal man exists. 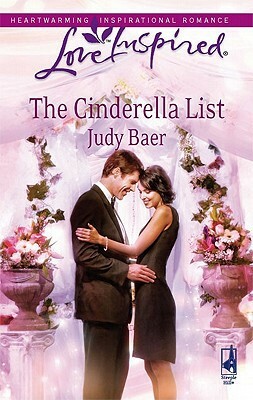 But when she caters a party for Jake Hammond, Marlo realizes he could be the man she's been waiting for. There's only one problem: Jake is super wealthy, and Marlo's not sure she fits into his blue-blooded world. But Jake is determined to show Marlo that with a little faith and a lot of love, he just might be the one. After reading some of Ms. Baer's Steeple Hill Cafe books and hating them (just not my style, I was a bit worried about this one. But it was absolutely EXCELLENT!!! It makes me perhaps want to give her cafe books another try and try to read them from another view point. I will say right off that this story is nothing like the cover or the back of the book. Though Jake is an architect, he's love is a horse ranch he is partners with his father in. But it's not just a ranch. Jake, against his father's will, wants to start a therapy place for children who have physical and mental disabilities. The moment Marlo saw Jake, she knew he fit every trait on her Cinderella list. But after catching her ex-fiance with another woman, she promised herself she'd never be the other woman. And since it was plain that Jake had his own fiance, she tried to stay away from Jake - but he was like a big magnet and a few stolen kisses made her try to push away further. Jake was a sweetheart! He could certainly be my Prince Charming. Amelia had a certain appeal also - at the end. There were so many well-defined characters in this book and they all just added to the story. But when Jake finally told Marlo they were going to talk and no excuses - I knew he had his priorities straight!